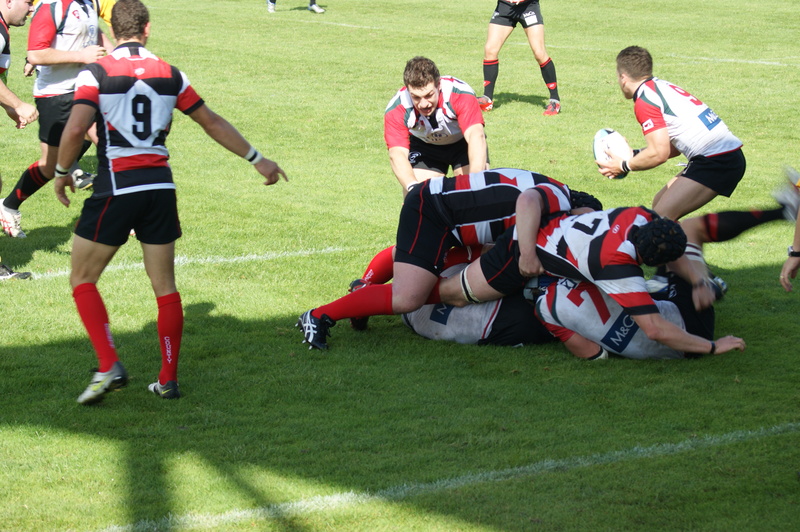 Well Saturday just gone was the big afternoon which meant that I got to try Rugby at the other Glasgow club. So so different and what a relief I can tell you. I cycled to the ground about 10 miles away the way the crow fly’s and luckily on a bike you can follow the crow. Arrived in plenty of time, allowed 2 hours but did it in less than an hour, first impressions, nice ground, largish stand on one side open on the others. Pitch looked good, facility to park my bike. First off I had to part with a tenner to get in. The guys on the gate where very friendly and not a yellow jacket to be seen. Straight into rugby chat and they understood my disappointment with the Warriors and promised better at the Hawks. Showed where the bar was told which players to watch for who was new etc…..and thats how rugby should be. No objection to my camera. Found myself a spot on the terrace close to the touch line/try line and settled down to watch the players warm up. Sun was shining and the pitch looked immaculate. 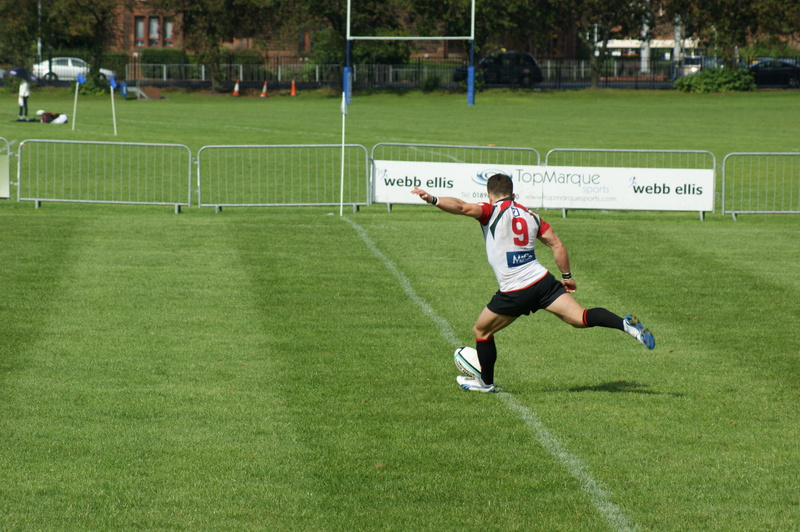 I had had an eye on one of the a joining pitches in the distance where a 2nd XV game was talking place. 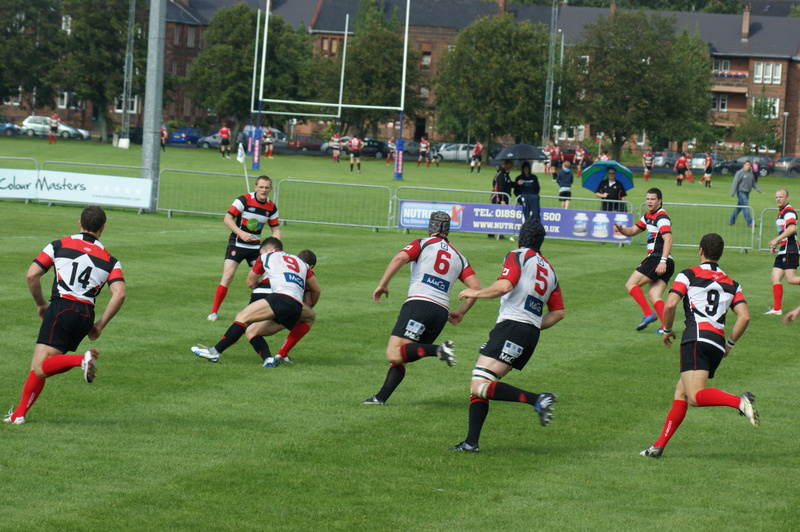 Glasgow Hawks play in the Royal Bank of Scotland Premier One, and this afternoon they where home to Sterling County. Not to clear on the set up of this league yet but around Christmas they go into a play off/Mini league. 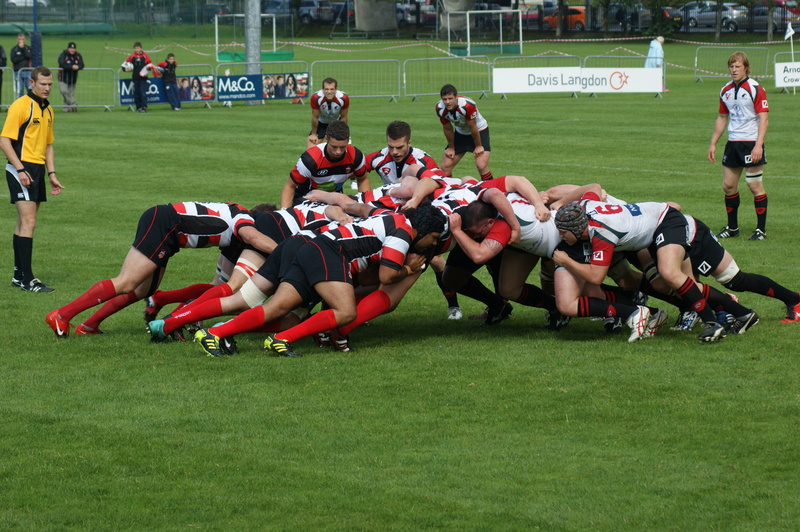 Apart from winning the league there are a further two places up for grabs in next seasons British and Irish Cup. The game got started but I must add that the Referee Mr J Matthew seems to like using his yellow card and in my view used it a little to much. 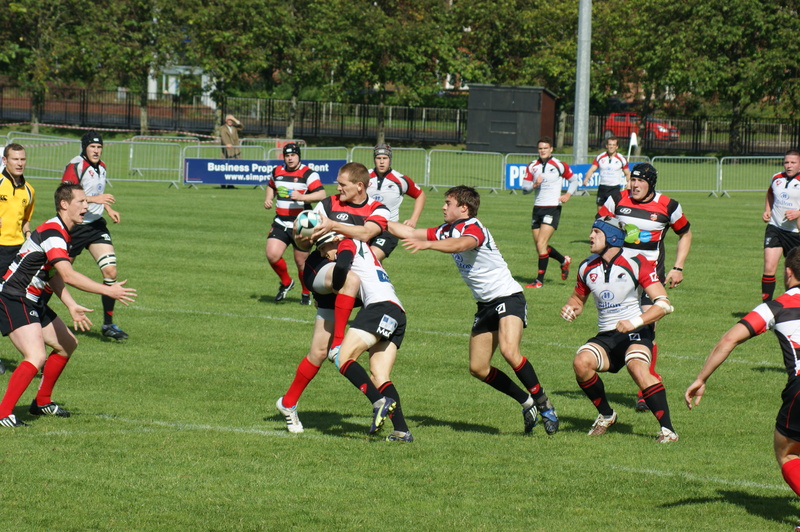 Game was good standard lower than I am used to but still good, this game had plenty of try’s with the Hawks soon getting on the score sheet with a hat rick of try’s from Tom Steven and another try from Ross Miller and this lead to a bonus point for the Hawks. Second Half under way and a couple of try’s from the Hawks saw County well and truly sunk but they rallied in the last 15 minutes to get some points on the board but the full time score was Hawks 36 County 22. Good game muched enjoyed with the added bonus that the Hawks captain and Second row Rory Mckay played for the Blues a number of seasons ago. I will be returning to the next game and to future games as I was made to feel very welcome, there was a bar there was no hassle and I was allowed to use my camera too. Rugby as it should be. I was even invited to get involved with the club and this is something that I am thinking about at the moment. As for the Warriors well I am still tempted to go watch when Travesio play but thats about it. Something about watching Italian Club rugby that appeals so that evening I will be cheering Travesio while trying to avoid the stewards……. 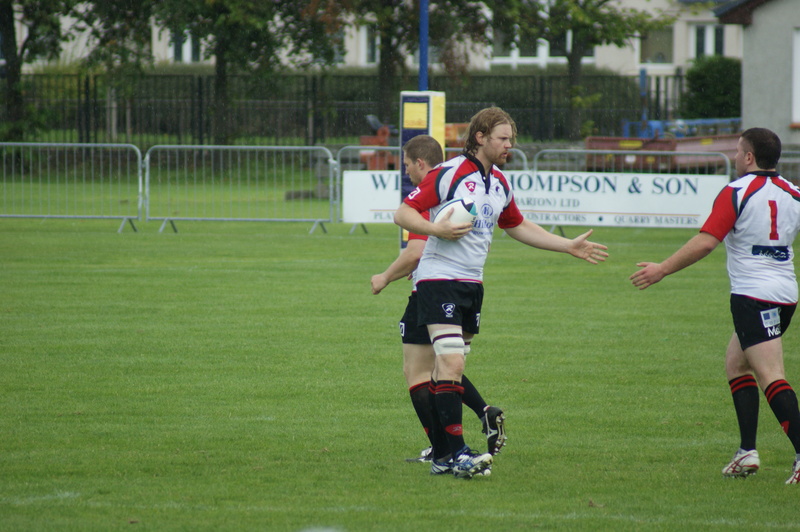 Rory Mckay greets his team just before kick off. 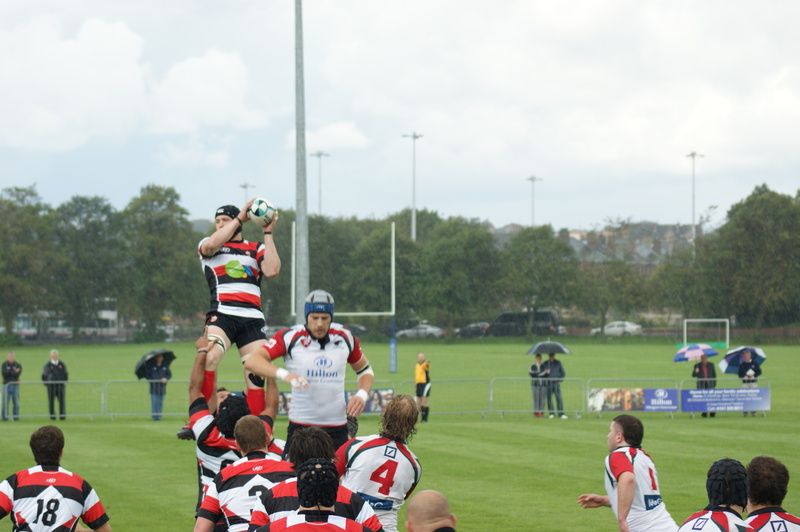 County win the line out. 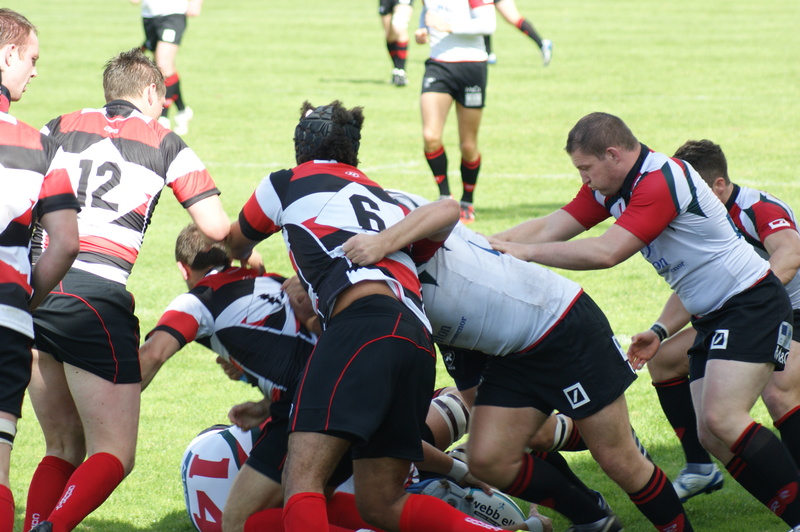 Well where to start…….This evening was the start of watching rugby in my new town….The Team Glasgow Warriors and they were playing Newcastle Falcons in a pre-season friendly. I was looking forward to the game and arrived at Firhill in plenty of time. Firhill in situated in Partick and area to the west of the city centre in Glasgow and the ground is owned by Partick Thistle F.C. Three sides are seated and one end is open and just a mound of mud. I was interested to see the Falcons as they signed the Blues scrum half in the summer and I wanted to see how he was getting along. I knew the Glasgow squad would be depleted as the Scotland players were with the national squad getting ready for the world cup. The problems started as soon as I arrived at the ground and I was searched on the way in, never been searched going into a rugby ground before not even Twickenham. I was then warned that I would not be allowed to use my camera. This has never happened before even at Twickenham I have used my camera and never been asked not to. Then I found somewhere to sit not used to sitting at a rugby ground apart from Twickenham I think this was a first for me…..oh I may have sat at Franklins Gardens once. The ground was only open on one side and patrolled by security guards who insisted on walking around the ground all the time getting in the way. The game got underway I was sat near the front but still miles from the pitch. Still the security guards walked around the stand getting in the way blocking views etc. At Twickenham people are discouraged from moving around while the game is in play…..Seems not here and it does spoil the game with your view being interrupted by the guards. I got the camera out and sure enough I was told off and told to put it away. Then a professional photographer was in trouble for not having the right pass for being pitch side. I resorted to taking off my hoodie and hiding the camera in the sleeve and using it that way……Pleased to say it worked to a certain degree and the photos are now on facebook. I am used to watching rugby and being able to talk to the touch judge and ask him to explain decisions that the ref makes, they are always happy to do this and it’s all part of the banter and the game. But not here the touch judge was just too far away. What really shocked me was that the players are kept away from the fans they are on the other side of the pitch. I have never seen this before in rugby and it was a real eye opener. Once the final whistle went the players were off like a shot and they didn’t even turn to acknowledge the crowd and come over and see the supporters. Guys these people pay your wages and if it wasn’t for them you would have a boring mundane office job like the rest of us. All games I have been too allow children on to the pitch at the final whistle to speak with the players and get autographs. But not here not today. One lesson learnt today, this was only the second time that I have watched rugby at a football stadium, first off a few seasons again and it was the semi-final if the English Premiership between Tigers and Bath and was played in Leicester at the Walkers Stadium. The similarities were the same as this evening. So I am thinking that Rugby played at Football Stadiums is just a no go. Sad but true in my experience. That’s it I very much doubt I will visit Firhill again or the Glasgow Warriors. I have learnt another lesson tonight and that is I won’t be going back to football again in a hurry. That’s why I left in the first place it was too much all this being watched being told you can do this and not do that. But the real shocker was on leaving the ground to be meet by Police outside. I have never seen that before apart from Twickenham but that is because of the number of people there. Tonight was too much. 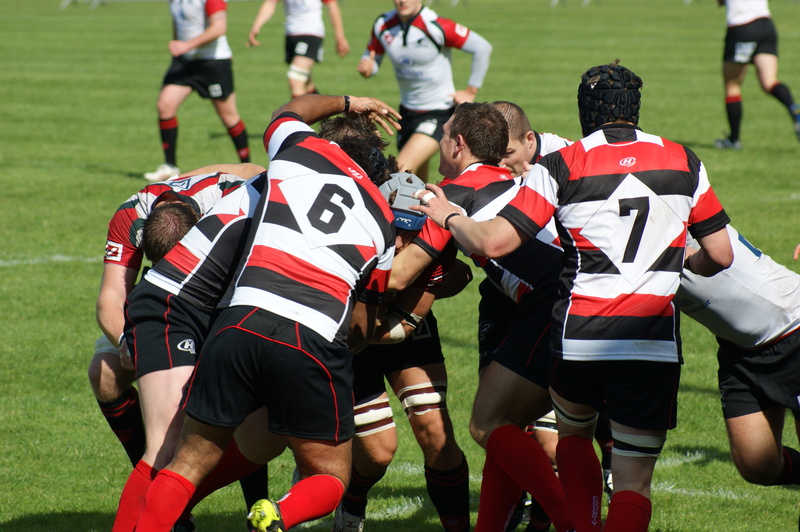 Rugby has one more chance for me so I will go in a couple of weeks’ time to watch Glasgow Hawkes and see how I get on there, I am hoping it will be more of what I am used to and I will get the bug back because right now as I write this I don’t love rugby anymore. Oh and one last thing……..there was no beer…….well I guess next it will be no food at Tesco……no beer at Rugby……..SHOCKING………. Sky TV has started to spoil my Rugby……. Bit of a moan this morning, I know its a lovely sunny morning and looks like being a fab day again but I need to say this. As some of you will know I am a rugby fan and I would go as far to say that I am very passionate about the game. Today my team the Bedford Blues are playing in the semi finals of the play offs for the Championship and are playing away at Worcester. Sky decide to show the game on their television chanels so kick of is at 12.15 meaning there is know way that i can get to see the game so thank you for that sky, I just hope its worth it for you to show the game and spoil it for the true supporter. 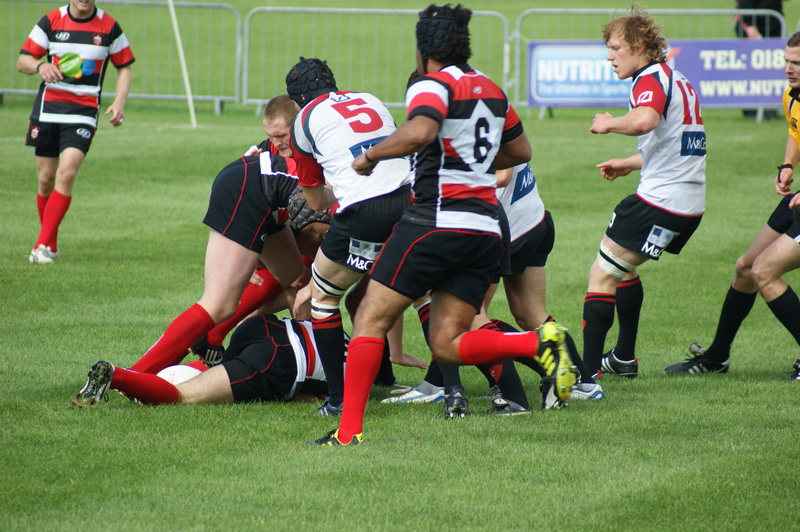 I feel I should also say that his has caused problems for the other semi final this afternoon between Cornish Pirates and London Welsh and this game will kick off at 17.45 so what hope have London Welsh fans got of seeing the game unless they can afford to stay overnight in Cornwall. Then next Saturday the Blues play in the final of the British and Irish Cup and this game is being played in Bristol and yet again sky want the kick off at 17.05 so yet again there is know way I can get back from the game without a 9 hour sleep on a bench in London. Ok years ago i would have done this without even thinking about it but with my current health problems I just dont think this would be wise. So yet again Sky you have spoilt it for me and I have to sit and home and wait for updates on Twitter as to how the game is going. Why do you do it Sky and there is know way in the world I would every pay to see your television and from what I have seen in the listings your channels are nothing but repeats same program night after night surely that isnt television….. Sorry folks but i am going to have a little rant on this blog this evening…..I learnt yesterday that the RFU have decided not to let Twickenham be used for an up and coming super 15 game for the Christchurch Crusaders…..Since the earthquake it have been deemed that the ground cannot be used and this was an idea opportunity to move the game to London and get a decent crowd…. I for one would have gone and there is a large Australian South African and New Zealand community in London so why RFU did you say know…..Don’t give me the old we don’t have enough time….because if you had wanted to you could have and a lot of rugby fans in this country would have had a once in a lifetime opportunity to see a super 15 game…. My next point is the British and Irish Cup sorry but i still cant see the point of this cup, ok we have all the championship clubs taking part then a mixture of Irish Scottish and Welsh teams and some of those are club teams and some are the second XV for the magners league sides. Sorry cant see the point and with attendences not that high just over 1,300 when the Blues played Leimster in the quarter finals last weekend what is the point. Two options either extend the league and abolish the cup, but not sure how that would work re play off etc or expand the cup to exclude the magners league second XV but include 2nd teir clubs from France Italy and maybe top clubs in Spain and Portugal. The benifit of this would be to expand the game and take it to new people give the fans a weekend away in a new rugby town and hopefully take the game to new fans. I for one would save get a second job anything to go and see the Blues play a game in France or Italy anywhere in mainland Europe if I am honest. So come on RFU get you finger out and have a look at this as i am sure you will agree we all want to see the sport grow and open new doors. I also feel that there would be an extra cost involved for clubs but with the amount of money the RFU and IRB have they could subsidize the teams.